THE WHOM -TO -TREAT GRAPH The rate of ganglion cell loss and resulting functional decay is very different among different glaucoma eyes. Quality of life is clearly reduced when visual field defects become severe, cf. the severe functional impairment. Line A represents the effect of aging alone. In glaucoma loss of visual function is often much more rapid. An older patient, diagnosed late in life, with a moderate rate of progression (B) has a much lower risk of developing severe functional impairment than a younger patient with the same amount of field loss at diagnosis and rate of progression (C). A very slow rate of progression may be tolerated by the patient and treatment left unchanged (D), while a rapid rate of progression (E) needs a considerably lower target pressure. It needs to be remembered that it is the extent of binocular visual field or the field of the better eye that largely determines the patient’s quality of life, while the rates of progression of each eye separately are needed to determine treatment. To assess the likely Rate of Progression (RoP) is an important part of patient management and the measured rate is a very important factor that should determine target pressure and treatment intensity (See Ch. Introduction) [I.D]. Many studies have found that progression is usually linear1-4, but the goal of intensifying treatment is to decrease rate of progression. Please observe that perimetric printouts of progression using the MD or VFI indices are age-corrected, so that a normal eye would not show any age-related deterioration over time. The goal of glaucoma treatment is to maintain the patient’s visual function and related quality of life, at a sustainable cost. The cost of treatment in terms of inconvenience and side effects as well as financial implications for the individual and society requires careful evaluation (See Ch. Introduction). Quality of life is closely linked with visual function and, overall, patients with early to moderate glaucoma damage have good visual function and modest reduction in quality of life, while quality of life is considerably reduced if both eyes have advanced visual function loss. Glaucoma is still a leading cause of blindness in Europe. A considerable percentage of glaucoma patients become blind in both eyes or encounter serious field loss in both eyes5-7. Major risk factors for glaucoma blindness are the severity of the disease at presentation and life expectancy8,9. A 60-year-old patient with bilateral moderate visual function damage at diagnosis has a greater risk of blindness than an 85-year-old patient with a similar amount of damage. Similarly a young patient with mild bilateral damage is at much larger risk of disability in his lifetime than an 80-year-old patient with moderate unilateral disease Thus, treatment must be individualised to the needs and rate of progression (RoP) of each patient (See Fig. 1 Ch. Introduction) [I,D]. The risk of ever encountering loss of quality of life from glaucoma should determine target pressure, intensity of treatment, and frequency of follow-up [I,D]. Thus, patients with severe functional loss or younger patients with manifest disease should have more aggressive treatment and closer follow-up than patients with little or no risk, e.g., very old patients with early field loss or unilateral disease [I,D]. Glaucoma suspects, e.g., patients with elevated IOP and otherwise normal findings, have even smaller risks. In most patients with advanced glaucoma and reasonable life expectancy, aggressive IOP lowering treatment might be recommended10,11 [I,D]. Very old patients with mild loss, relatively low IOP levels and significant health problems, might prefer being followed without treatment (See also Ch. Introduction) [II,D]. When treatment options are discussed with a patient, his general health status and personal preferences must be considered and respected. It is also important to ensure that patients are able to comply and persist with therapy [I,D]. Disease progression rates (RoP) in POAG, the most common form of glaucoma differ very much between patients, from rapid to very slow12-16. This makes it necessary to determine the RoP in patients with manifest glaucoma (See Fig. 1 Ch. Introduction) [I,D]. Many patients with POAG/NTG show no or only small deterioration despite years of follow-up17,18, while rapid progression is common in others, e.g. in exfoliation glaucoma18. Glaucoma patients may continue to show progression despite treatment, even with IOP levels within the statistically normal range. Relying on tonometry alone for glaucoma follow-up is, therefore, insufficient regardless of IOP level17,18. diagnosis to make it possible to identify rapidly progressing patients [II,D]. After two years of perimetric monitoring without progression being detected the frequency of tests may be reduced [II,D]. Once the progression rate has been determined the target pressure is re-evaluated and be based on the measured rate of progression and IOP values measured during the follow-up time [II,D]. Risk factors are then less important than at diagnosis (See Ch. 2.2). In most Western countries approximately half of patients with manifest glaucoma are undiagnosed24-27, and glaucoma is often diagnosed late8. Improved case finding and possibly screening of high risk groups are necessary to allow diagnosis at earlier disease stages. Screening options for high risk groups should be evaluated. To discover and treat those at risk of losing functionally significant vision is a more important goal for effective glaucoma management than widespread treatment of patients with ocular hypertension. Currently, the only approach proven to be efficient in preserving visual function is lowering IOP28-31 (See Ch. Introduction and FC VI to XI) [I,A]. Other possible treatment areas have been investigated, including ocular blood flow and neuroprotection. There are experimental as well population based studies indicating that perfusion pressure may be relevant in glaucoma31-37 but very difficult to measure38 a specific glaucoma phenotype characterised by vascular dysregulation has been described32,33. An increase of IOP will lead to a reduction of perfusion pressure. Blood pressure levels may also be important in glaucoma17,36,37. However, there is no conclusive evidence to support the idea that perfusion pressure can be increased by manipulating blood pressure or ocular blood flow in glaucoma patients. Neuroprotection can be defined as a “therapeutic approach” aiming to directly prevent, hinder and, in some cases, reverse neuronal cell damage. Since glaucoma patients can continue deteriorating in spite of an apparently well controlled IOP, the need for effective non-IOP related treatments is widely acknowledged. Several compounds have been shown to be neuroprotective in animal models of experimental glaucoma39-43. So far, no compound has reached a sufficient level of evidence to be considered as a neuroprotectant in humans. A large long-term randomized trial using a neuroprotective agent, memantine, was analysed several years ago, but with negative results. A more recent study claiming that topical brimonidine might haven neuro-protective properties in glaucoma patients, has been questioned in a systematic review on neuroprotection in glaucoma44,45. In most western countries, approximately half of patients with manifest glaucoma are undiagnosed24-27. Therapy in glaucoma management aims to lower IOP to slow the rate of visual field deterioration. Target IOP is the upper limit of the IOP estimated to be compatible with a rate of progression sufficiently slow to maintain vision-related quality of life in the expected lifetime of the patient. It should be re-evaluated regularly and, additionally, when progression of disease is identified or when ocular or systemic comorbidities develop [II,D]. There is no single Target IOP level that is appropriate for every patient, so the Target IOP needs to be estimated separately for each eye of every patient (See FC IX and X) [II,D]. When taking the IOP reading, it is advisable to consider CCT [I,C]. Several clinical studies have identified that worse initial visual field loss is the most important predictor of blindness from glaucoma7,47-49. When considering the Target IOP for one eye, the vision status of the other eye should be taken into account. In a newly-diagnosed patient, the rate of progression is unknown and Target IOP is based on risk factors for progression (See Ch. 2.2.2.1). After sufficient follow-up and with sufficient visual field tests to reliably determine the progression status, usually 2-3 years, the importance of the risk factors for decision-making decreases and importance of the measured rate of progression increases; the rate of progression should be used to adjust the Target IOP, taking into account IOP levels over the observation period, life expectancy, and current levels of visual function damage (See FC X)22. There is little evidence base to support any particular algorithm to set the Target IOP, but data from clinical trials may be used as a guide. As clinical trials have shown that progression occurs in eyes that have an IOP within the statistically normal range (<21 mmHg), older recommendations that treated IOP should be simply within the statistically normal range are no longer regarded as sufficiently ambitious. In newly diagnosed patients, the Target IOP is initially determined according to stage of disease and the starting IOP, with the treatment goal being a specific IOP level or a percentage reduction, whichever is the lower50 [II,D]. For instance, in early glaucoma, an IOP of <21 mmHg with a reduction of at least 20% may be sufficient. In moderate glaucoma, an IOP <18 mmHg with a reduction of at least 30% may be required [II,D]. Lower Target pressures may be needed in more advanced disease [I,D]. 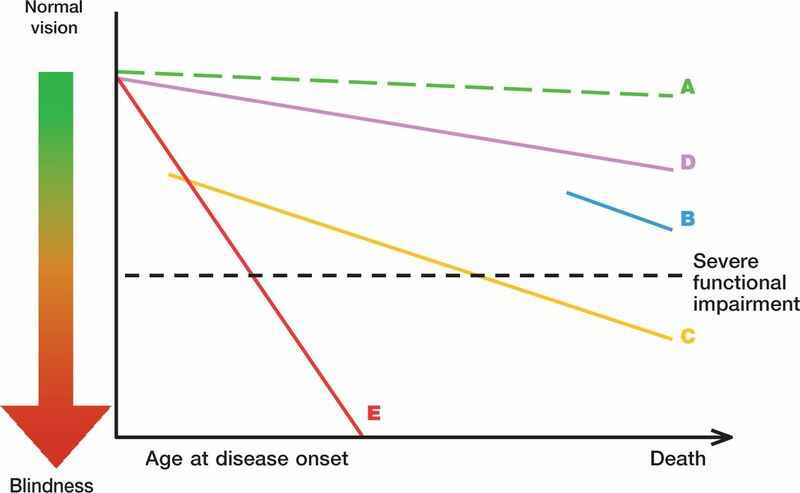 The Target IOP based on stage of disease and IOP then needs to be refined according to the presence of other risk factors, expected longevity of the patient, the burden of therapy and the patient preferences (See FC X)46 [II,D]. Initial therapy may be with topical medication or laser trabeculoplasty [I,A]. The principles of adjusting therapy to achieve treatment targets are shown in Flow Charts IX - X - XI. To minimize side effects, the least amount of medication required to achieve the desired therapeutic response should be given. If a patient fails to attain the Target IOP during follow-up, and additional therapy is being considered, then the Target IOP should be reaffirmed to ensure that it is still appropriate [II,D]. If the visual field is worsening at a rate that may threaten Quality of Life during the patient’s expected lifetime, then the Target IOP, if previously met, should be lowered; a further 20% reduction has been shown to be effective51. If the Target IOP had not previously been met, then additional therapy should be considered, in consultation with the patient, weighing the risks and benefits of the additional intervention (See FC XI) [I,D]. If there are sufficient visual fields to judge the rate of progression, and this rate is sufficiently slow not to impact on the patient’s quality of life, then the Target IOP may be revised upward if the Target IOP has not been met or if the patient is on excessive therapy or is experiencing side effects [II,D]. If there are insufficient visual fields to judge the rate of progression and the Target IOP has not been met, then additional therapy should be considered, as above [II,D]. Several prospective randomized multi-centre controlled clinical studies have clearly established the benefits of IOP reduction in managing POAG at various stages of the disease whether of the ‘high pressure’ or ‘’normal pressure’ variety as well as reducing the conversion of OHT to POAG10,18,28,52-56 [I,A]. Most forms of open-angle glaucoma and many types of chronic angle-closure glaucoma are initially treated with topical and occasionally orally administrated agents that act either on the reduction of aqueous humour production or enhancement of the aqueous outflow or on both. An uncommon exception to initiating treatment with medical therapy is for eyes with a very high level of IOP at presentation causing an immediate threat to sight. Additionally many forms of childhood glaucoma are managed with early surgery [I,D]. 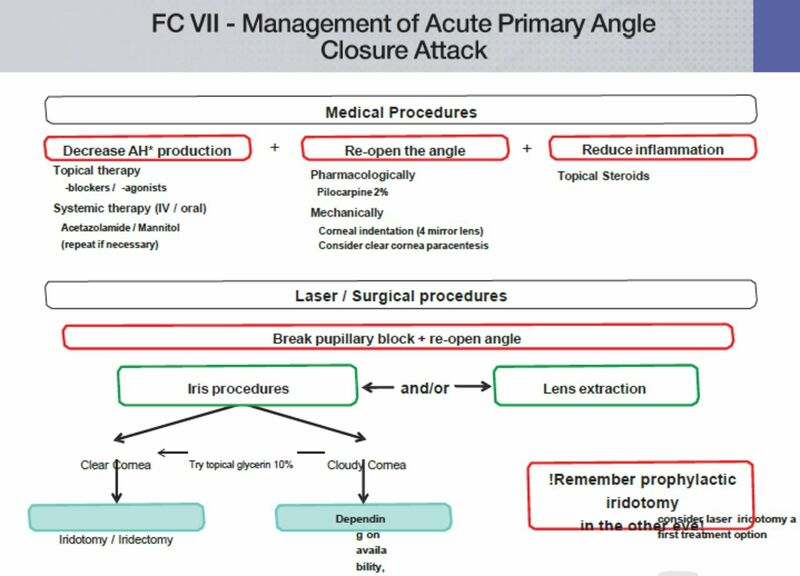 Although acute angle closure with or without glaucoma needs rapid laser or incisional surgery, medical treatment usually will be initiated as a first step in most cases. Laser treatment may be a suitable first option for patients with known intolerance or allergy to topical agents or suspected poor compliance [I,A]. When initially selecting medical therapy it is important to consider some relevant patient’s characteristics as well as features related to the drug (See FC XII and XIII). It is recommended to initiate the treatment with monotherapy (See FC XIII - XIV) [II,D]. Treatment is considered “effective” when the achieved IOP reduction on treatment is comparable to the published average range for that drug in a similar population. According to a meta-analysis of randomised controlled trials, the highest reduction of IOP is obtained with prostaglandins, followed by non-selective b-blockers, alpha- adrenergic agonists, selective b-blockers and at last topical carbonic anhydrase inhibitors57. It should be noted, however, that treatment effects depend on baseline IOP, with larger reductions in patients with higher pre-treatment pressure levels. At low IOP values medical and/or laser therapy have smaller effect on IOP. Therefore, when evaluating the efficacy of a therapy or a drug it is important to consider the pre-treatment baseline IOP58. If this initial therapy reduces IOP to the target and is well tolerated, therapy can be left unchanged, but the patient needs to be monitored with regular checking of endpoints [I,D]. If the initial therapy does not seem effective, with the target pressure not being reached, or the drug is not tolerated, one should switch to another monotherapy rather than adding a second drug [II,D]. This applies also to prostaglandin analogues, (PGA) when used as first choice. As there are non-responders to certain PG analogues the switch to another PGA or another class of monotherapy might be of benefit [II,D]. Laser therapy may also be a therapeutical option (See FC XIII) [I,A]. 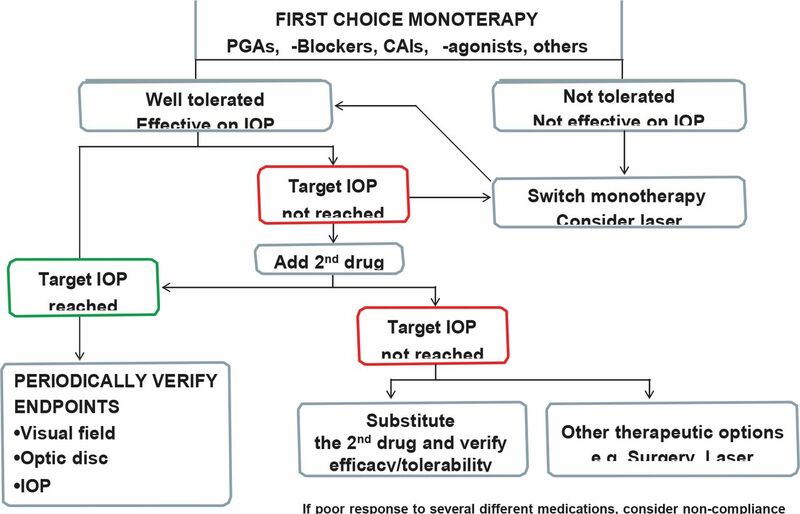 If the first choice monotherapy is well tolerated and has effective IOP lowering but has not succeeded in reaching the target pressure, the addition of a second drug should be considered [II,D]. While individualizing adjunctive therapy, issues to consider in selecting an adjunctive agent include additive efficacy, safety, frequency of dosing and cost. It is recommended to combine agents with different modes of action, one that affects production of aqueous humour and another that influences outflow [II,D]. In general, treatment with a combination of agents of different classes is associated with superior IOP lowering efficacy compared to each of the components used alone [I,A] (see Tables 3.1-3.2). However poly- drug regimens for glaucoma pose several important clinical challenges: multiple topical treatments may jeopardize adherence59,60, result in reduced efficacy through wash-out of earlier medications with later medications61,62 and increase exposure to preservatives63,64. Therefore, fixed combination therapy, when available, should be preferable to two separate instillations of agents [I, B]. Currently, all fixed combinations available in Europe contain a beta-blocker. However, beta-blocking agents can be associated with systemic side effects and need to be used cautiously in patients with serious concomitant cardiopulmonary diseases. It is therefore mandatory to exclude patients with these contra-indications before prescribing fixed combinations [I,D]. It is not recommended to combine two bottles of fixed combinations as both will contain a □-blocker and double the amount of this active drug with the risk of more systemic side effects [I,D]. On the other hand, fixed combinations containing timolol may be associated with a better local tolerability in some patients, though data are limited65. Fixed combinations usually have clinical equivalence to unfixed combinations; slight differences in IOP-lowering efficacy may be seen in some cases66,67. may exceed the efficacy range that can be expected by a single agent. Therefore, although the standard treatment algorithm remains unchanged, the time interval between incremental therapeutic steps may be decreased, combination therapy, fixed or unfixed, can be adopted more quickly than usual or even immediately [II,D]. If combination therapy fails to lower IOP sufficiently, one can either substitute the second drug or add a third medication to the fixed combination. At this stage however laser or incisional surgery, if possible, should be considered [II,D]. The pre-post IOP graph shown below is a useful tool to show the IOP changes induced by treatment and its use should be encouraged in publications. The Pre - Post IOP Graph. A simple graph can be used to show the IOP lowering effect. Different shapes/colours can be used to show different patient series or different observation times. Vertical and horizontal lines show respectively Pre and Post Treatment IOP levels of interest, here placed as examples at 15 and 21 mmHg. Areas of desired effect under the oblique “no effect” line can thus be defined. Treatment “A” blue dots: eye n 1 lies on the “no effect” line. Eyes n 2 and n 3 both show a large effect, with only the former below the 15 mmHg line. 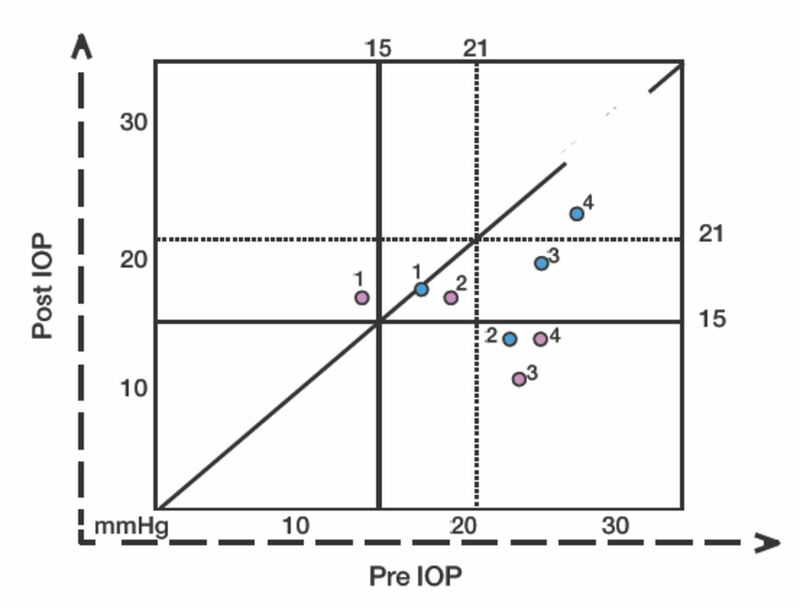 Eye n 4 shows a sizeable decrease of IOP but the absolute level is still >21 mmHg. Treatment “B” red dots. Eyes n 1 and n 2 show a slight increase and a slight decrease of IOP, respectively; eye n 3 shows a very large effect, as well as eye n 4, both remaining below the 15 mmHg line. Assess each eye individually when deciding the most appropriate therapy. It is essential to involve patients as informed partners in decisions regarding the management of their condition. The least amount of medication (and consequent inconvenience, costs and side effects) to achieve the therapeutic response should be a consistent goal. A therapeutic medical trial on one eye first can be useful to determine the IOP lowering efficacy, although not always logistically feasible or advisable (e.g., very high IOP or advanced disease). Usually there is no need to start treatment until all baseline diagnostic data are collected, unless the IOP is very high and there is severe damage. The following pages outline the most frequently used anti-glaucoma medications, and emphasize their mode of action, dosage and side effects. A complete list of all possible medications is beyond the scope of the Guidelines. Antiglaucoma drugs have been available since 1875. 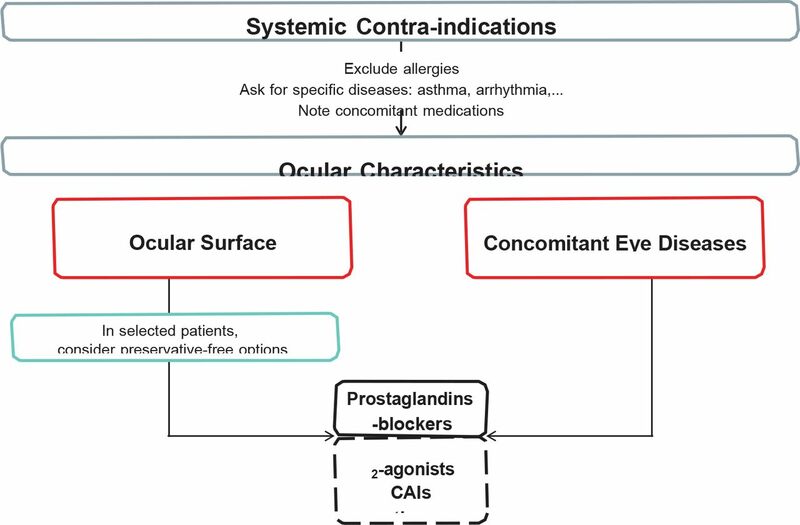 The following diagram shows the chronology of the introduction of topical intraocular pressure-lowering medications (Fig. 3.3). IOP lowering molecules and year of first clinical use. FC: fixed combination. In black: monotherapy. There are six classes of topical antiglaucoma drugs. The following tables contain only the most common classes and compounds, their most common side effects and contraindications. They are listed in order of first and second line drugs. The seventh category is systemically administered osmotics. The use of some compounds like epinephrine and dipivefrin has decreased significantly since drugs with better efficacy and fewer side effects became available. The text should be considered as a general guide, and cannot be all-inclusive. 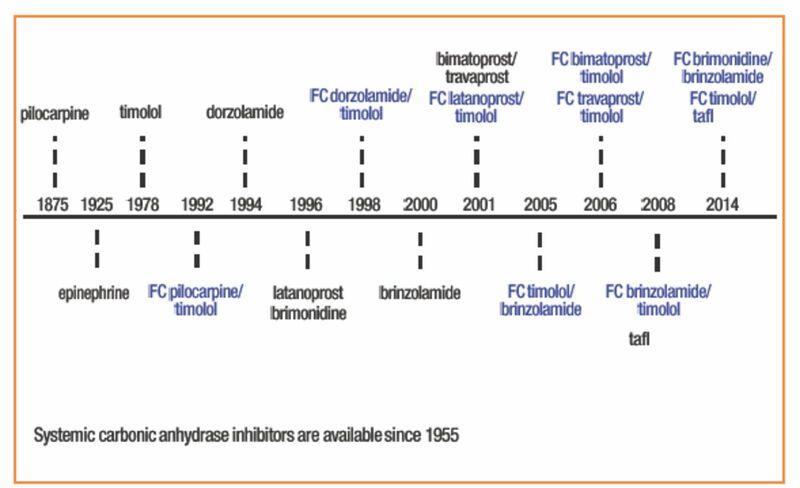 Since their development in the 1990s, prostaglandin derivatives (latanoprost, travoprost, bimatoprost and tafluprost) (Table 3.3) have progressively replaced beta-blockers as first-choice/first line therapy. This is mainly because they are the most effective IOP- lowering agents54, lack relevant systemic side effects and require just once-daily administration. Recently, a number of latanoprost generics as well as preservative-free and BAC-free prostaglandin formulations have entered the glaucoma market. The primary mechanism of action of prostaglandins is to increase uveoscleral outflow, reducing IOP by 25%-35%. Reduction of IOP starts approximately 2-4 h after the first administration, with the peak effect within approximately 8-12 h. Thus, IOP measurements taken in the morning represent the peak effect of the prostaglandin analogues for patients administering the drug in the evening. Clinical trials that measured 24-hour IOP suggested that evening administration is generally preferable because it gave a better circadian IOP profile68-70 [II, B]. These studies also reported that eyes treated with PG derivatives have reduced short-term IOP variability as compared to eyes treated with other classes of drugs71. Maximum IOP lowering is often achieved 3-5 weeks from commencement of treatment. Differences among drugs within this class in the capability of reducing IOP did not exceed 1 mmHg72. When combined with most of the other antiglaucoma drug classes, prostaglandin agents provide additive IOP lowering. Non-responders to prostaglandin analogues (e.g. eyes with IOP reductions of less than 10% or 15% from baseline) are fewer than 10%73,74. Some reports indicate that poor responders to one prostaglandin agent might respond to another agent within the same class75,76. Conjunctival hyperemia, generally mild, is a common finding with slight difference in frequency and level among agents within this drug class. It usually decreases over time. Other PG side effects are reported in Table 3.3. Details on the mode of action, IOP lowering effect, contraindications and side effects of other first line drugs (□-blockers, carbonic anhydrase inhibitors, alpha-2 selective adrenergic agonists) and second line drugs are listed in Tables 3.5-3.10. Long-term topical glaucoma medications may cause and/or exacerbate pre-existing ocular surface disease (OSD), such as dry eye, meibomian gland dysfunction and chronic allergy77, which, in glaucoma patients, has a much higher prevalence than in the general population63,64,78. OSD may follow chronic use of antiglaucoma medication and/or the preservative benzalkalonium chloride (BAC). BAC, a quaternary ammonium compound is the most frequently used preservative agent in eye drops and its usage correlates well with the signs and symptoms of OSD63,64,79-82. Such signs and symptoms can diminish if BAC-preserved drops are substituted with non-preserved drops63. An unwanted effect of BAC is a reduction in the success rate of filtering surgery83-85. In vitro studies suggest that alternative preservatives are significantly less toxic than BAC86-91. Other therapeutic possibilities are the use of preservative-free or BAC-free medication, decreasing the number of preserved eyedrops i.e. by using fixed combinations; treating the ocular surface with unpreserved tear substitutes and performing earlier laser or surgery. When considering OSD four factors have to be considered: the active compound, the specific preservative, the ability of the patient to use single-dose preparations and the patient’s ocular surface. The European Medicines Agency (EMEA) has suggested that the use of preservatives should be avoided in “patients who do not tolerate eye drops with preservatives” and in those on long-term treatment, or to use “concentration at the minimum level consistent with satisfactory antimicrobial function in each individual preparation”, with a specific indication to avoid mercury containing preparations92. Not all patients are sensitive to preservatives and not all the local side effects observed with topical antiglaucoma medications are induced by preservatives. Particular attention should be paid to glaucoma patients with pre-existing OSD or to those developing dry eye or ocular irritation over time. This can be done by careful assessment of redness of the eyelid margin, positive corneal and conjunctival fluorescein staining or reduced tear break-up time [I,D]. By definition a generic drug is identical to a brand name drug in dosage, strength, route of administration, performance characteristics and intended use. For the purposes of drug approval, the interchangeability of a generic drug and the corresponding brand-name drug is based on the criterion of “essential similarity”. In ophthalmology this concept is problematic, because it is difficult to prove “essential similarity” in clinical studies. With systemic drugs bioequivalence studies are performed using blood samples to determine whether the plasma concentration within certain limits equals the branded drug. With topical eye drops such studies obviously cannot be performed. because different adjuvants may alter the viscosity, osmolarity and pH of the eye drops and therefore have an impact on both tolerability and corneal penetration. Nevertheless anti-glaucoma generics drugs are currently prescribed at a large scale, as many drugs are becoming off patent. For latanoprost, the generic share is more than 65% in most European countries. To which degree these generics are similar in efficacy and tolerability is not well studied. Only few clinical studies have compared the effect of generic and brand IOP lowering medications in glaucoma, with variable results depending on the type of generic drug93,94. Other studies have shown a difference between the branded and the generic preparations concerning the size and amount of drops in the bottle, the structure of the bottle and the bottle tips95-98. Safety issues with corneal epithelial disorders have also been described with generics, due to an additional stabiliser compound99. When switching patients from branded to generic drugs, the IOP should be closely monitored [I,D]. Although there is no clinical evidence for clinical benefits arising from the use of dietary supplements in glaucoma, a recent survey has found that 1 in 9 glaucoma patients were using complementary and alternative medicine (CAM). Most were using herbal medicines (34.5%), dietary modifications (22.7%) or dietary supplements (18.8%)100. Based on the fact that some glaucoma patients continue to progress at low IOPs, there is much room for hypotheses, preclinical experiments, clinical trials and speculation. Some data from experimental studies suggest that dietary supplementation may reduce oxidative stress101, or that the omega 3 polyunsaturated fatty acids (PUFAs) decrease IOP in rats102. At the present time there is no robust interventional dietary supplementation study demonstrating the positive effect of such a treatment in glaucoma patients. Observational studies have suggested a reduced risk for glaucoma with higher fruit and vegetable intake103 or higher omega 3 PUFAs consumption in selected populations104. Conversely there is evidence that some of these compounds may cause harm, such as an increased intake of magnesium associated with a higher incidence of glaucoma105. Pregnancy-related changes in ocular physiology can influence IOP as well as the reliability of its measurements. Changes in hormonal levels, are thought to induce an IOP-lowering effect that increases throughout pregnancy (but particularly during the 24th-30th week) and can last for months after delivery106-108. The most sensitive period is the first trimester due to concerns relating teratogenicity, as the majority of IOP-lowering medications are within class C (See Table 3.10) meaning that adverse effects have been seen in animals or that there are no human or animal data (See Table 3.11). Therefore, for a woman with glaucoma who is of child bearing age, who might wish to conceive, the treatment strategy during pregnancy should be discussed [I,D]. The patient should be instructed to inform the ophthalmologist when pregnancy occurs. The potential risks to the fetus (and neonate) of continuing anti-glaucoma medications must be balanced against the risk of vision loss in the mother [I,D]. As IOP levels generally decrease during pregnancy, temporary treatment discontinuation can be considered under strict follow-up in some patients. However, if continuation of treatment is mandated, the lowest effective dosage of medication should be used. Moreover, systemic absorption should be reduced by punctal occlusion, eyelid closure, and blotting excess drops away during administration109 [I,D]. Drugs are classified in Classes A to X for use during pregnancy based on a hierarchy of estimated fetal risk (See Tables 3.10-3.11)110. Although very similar, some countries (e.g., Sweden, Australia, the Netherlands, Switzerland, and Denmark) have their own classification systems. Brimonidine is a Class B medication: however, there are reports of central nervous system side effects in young children111. The ability of this drug to cross the placenta and the lack of well controlled human studies during pregnancy do not allow ruling out possible adverse effects on the fetus. Betaxolol is also in class B and is characterized by a larger volume of distribution in the fetal circulation, high binding to proteins and therefore fewer central nervous systemic effects on the fetus. Timolol although class C, is available in low dosage (0.1%), in slow-release preparations which can be used once daily. Although these formulations are thought to reduce systemic absorption, strong evidence to support this is still lacking. Once-a-day timolol 0.1% gel may be a valid option if a beta-blocker is considered [I,D]. Prostaglandin-analogues should be considered with caution because of the theoretical risk of increased uterine contractility in pregnancy. If premature contractions appear PG should be discontinued immediately [I,D]. There have been no reports on any fetal complications related to the use of topical carbonic anhydrase inhibitors in humans, but animal studies have shown that high systemic doses, are associated with low weight offspring (Manufacturer’s Information: Azopt product monograph. Fort Worth, Texas, Alcon Ophthalmics, 1998 Manufacturer’s Information: Trusopt product monograph. West Point, Pennsylvania, Merck Inc., 1999). At clinically used concentrations, BAC has no known impact on the fetus112. Table 3.11 summarizes known adverse effects of anti-glaucoma drugs during pregnancy and breast-feeding. Although results from animal studies are worrisome, the overall level of evidence for the risk of giving anti-glaucoma drugs to pregnant women is low. Laser trabeculoplasty is considered to be a safe alternative113 except in patients with angle dysgenesis. However, IOP lowering success is lower in younger patients, such as in women of childbearing age114. Laser cyclodestruction, in spite of having been suggested as a valid option should be considered with caution because of risk of sight-threatening complications115. If surgery is planned, there are a number of considerations to be made. A supine position should be avoided116. For intervention under local anesthesia, topical, subconjuntival or retrobulbar, lidocaine is considered to be a safe option117. The use of anti-metabolites is strictly contraindicated, due to the mutagenic related risk. Depending on previous ocular surgeries and the age of patient, filtering surgery, including tube shunt implantation, can be considered112 [II,D]. Topical prednisolone and erythromycin have been shown to cross the placenta to a lesser extent than other medications of their classes, and can therefore be chosen as postoperative medication117,118 [II,D]. Special attention should be paid also during breast-feeding. Carbonic anhydrase inhibitors and beta-blockers may be used in nursing mothers as suggested by the American Academy of Pediatricians119. These are also the first line choices in infants with congenital glaucoma when medical therapy is being considered. Fixed combinations are all class C. Prescribing physicians should separately consider each of the drugs involved [I,D]. Neuroprotection can be defined as a “therapeutic approach” aiming to directly prevent or significantly hinder neuronal cell damage. Since glaucoma patients can continue deteriorating in spite of an apparently well controlled IOP, the need for effective non-IOP related treatments is widely acknowledged. Several compounds have been neuroprotectant in preclinical studies120. Only two have reached large scale clinical trials: a large long-term RCT using an NMDA antagonist, memantine, was analysed in 2008 with negative results. More recently, the results from a multi-center RCT of adults with low-pressure glaucoma (Low-pressure Glaucoma Treatment Study, LoGTS) has been claimed to show that brimonidine may have neuroprotective properties in comparison to Timolol44. No direct comparison has been done with other substances such as PG. However, the authors of the study and a systematic literature review have (both?) suggested that more substantial evidence is needed121,122. The majority of topically applied drugs, particularly if lipophilic, penetrate the eye via the cornea, in a lesser amount via the conjunctiva and thereafter the sclera. On average, the total tear film volume is around 7 µl and the rate of tear film turnover is approximately 15% (±1 µl) per minute but can double (washout effect) after the application of a topical drop with a volume estimated at 30-50 µl123. Although the cul- de-sac and tear film compartment can expand transiently after instillation of a drop it still cannot accommodate this whole volume and less than 5% manages to enter the eye; the rest will run down the cheek or will be drained through the nasolacrimal duct where an individually variable systemic absorption takes place through the highly vascularised nasal mucosa124. Once the medication is instilled into the conjunctival sac, the spontaneous tear flow will cause complete washout within 5 minutes. The washout effect depends not only on the increased tear fluid turnover, but also on the addition of a second drop within a short period. Therefore when poly-drug regimen is used, a minimum time span between different drops should be respected. When two drugs are instilled only 30 seconds apart, almost 50% of the first drug will be washed out. The recommended delay between drops is 5 minutes with a washout effect of less than 15%61,62 [I,B]. Blinking also may influence washout and allow only 15% of a topically applied drug to remain in the eye approximately five minutes after instillation. As drugs absorbed through the highly vascularised nasal mucosa avoid hepatic first- pass metabolism this might lead to systemic side effects. The instillation of one drop of timolol 0.5% for example may lead to a serum concentration of timolol that equals the intake of an oral 10 mg non-selective beta-blocker125. There is no evidence that nasolacrimal duct obstruction may increase the efficacy of a topical drug126 however it may reduce systemic side effects particularly from beta-blockers by minimizing the drainage into the highly vascularised nasopharyngeal mucosa109,127,128 [I,D]. Patients should be advised to shake the bottle before use as micro-suspensions tend to settle to the bottom of the bottle leaving the vehicle at the surface. Thus, patients may be simply applying mainly vehicle to the eye, rather than the active drug ingredient [I,D]. Glaucoma is a chronic progressive disease that requires continuous long-term cooperation of the patient with the glaucoma management proposed by the doctor. The commonly used term “compliance” has been increasingly replaced in recent times by the term “adherence”. Both are defined as the ‘cooperation of the patient with the recommendations given by the doctor’. However, the former is more passive ("I am taking the medication”), while the latter implies the active part of the patient in the process (“I am taking the medication exactly as you told me”). “Persistence” is defined as the length of time during which the patient is taking the medication as prescribed129. Despite easier medication schemes (for example drugs which require application once- daily) and more information for the patients about the disease, the rate of non-adherence has remained almost the same over the last 25 years; between 30%-70%. It is important to mention that the patients themselves overestimate their adherence and persistence rate (GAPS)132. Every patient is different and there are several types of non-adherence134. There are different ways for improving the adherence of patients. The most important measures are informing the patient about his/her disease and finding a therapeutic regimen which fits into the patient’s life-style135 [I,D]. – The doctor should inquire at every visit if the patient has side effects of the medication and switch if necessary. A patient who complains about side effects is usually not adherent to therapy. The patient’s cooperation, described as adherence and persistence, with the prescribed glaucoma management is mandatory to obtain effective IOP lowering and to prevent glaucoma progression. No drug can work unless it is taken. Clinically relevant or suspected pupillary block. 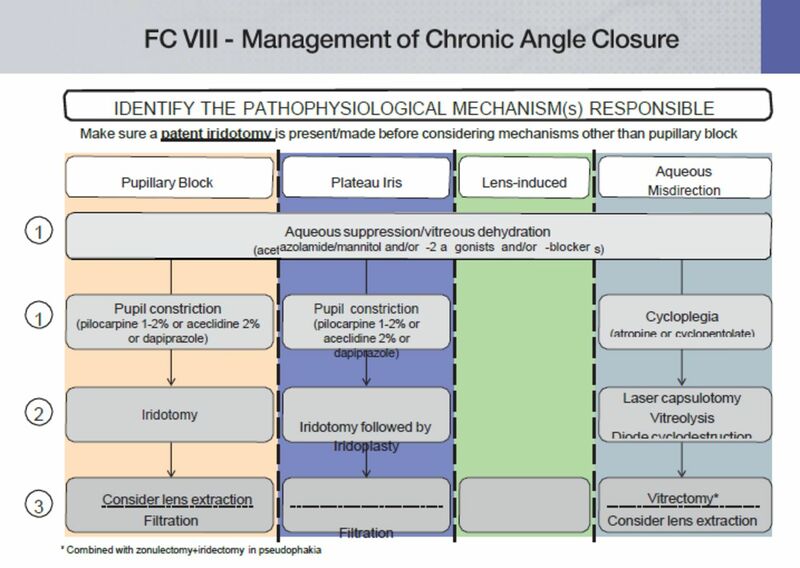 Potential prevention of acute and chronic angle closure (See FC X and XI). To reduce iris thickness and facilitate perforation instil 1 drop of Pilocarpine 2%-4% [I,D]. If the cornea is edematous, like acute angle closure, use topical glycerin 10% if available, systemic acetazolamide, intravenous mannitol or oral hyperosmotic agents (See FC XI). For prevention of IOP spikes use topical alpha 2 agonist 1 hour prior to the procedure and immediately afterwards [I,B]. After instillation of topical anesthetic a contact lens with contact lens fluid is placed onto the cornea. The lens keeps the eyelids open, stabilizes the eye, provides additional magnification, focuses the laser beam and acts as a heat sink. Lenses used are: Abraham (+66 diopters), Wise (+103 diopters) or CGI©LASAG CH lens. Iridotomy site [II,D] is usually chosen in the superior quadrants of the iris well covered by the upper eyelid (to reduce visual symptoms), in a thin looking area or an iris crypt. Whole thickness perforation of the iris is assumed when pigment, mixed with aqueous, flows from the posterior into the anterior chamber. Once a full thickness hole has been made, it should be enlarged horizontally to achieve an adequate size. Iridotomy size [II,D] should be sufficient for patency inspite of iris oedema, pigment epithelial proliferation and pupil dilation. Transillumination through the iridotomy is not a reliable indicator of success [II,D]. In case of thick dark irides, to reduce total Nd:YAG energy, pretreatment with argon laser in 2 stages may be considered141 [II,B]. In the first stage a low power argon of 90-250 mW, duration 0.05 sec, spot size 50mm is applied, followed by the high power argon of 700 mW, duration 0.1 sec, spot size 50 mm to create a punched-out crater appearance. Laser iridotomy is completed with Nd:YAG laser. When no Nd:YAG laser is available, Argon laser may be used [II,D]. Laser parameters should be individualized to each patient and adjusted appropriately during the procedure. Bleeding from the iridotomy site; this can usually be stopped by gentle pressure applied to the eye with the contact lens. With the argon laser corneal epithelial and/ or endothelial burns may develop. Visual disturbances occur in 6-12% (glare, blurring, ghost images, halo, crescent) are less likely to occur when the iridotomy is completely covered by the eyelid142,143. Transient elevation of the IOP is the most common complication in the early period. Elevation of IOP at 1 hour after iridotomy occurs in approximately 10% of primary angle closure suspect eyes144. Acute and (chronic) rise in IOP is more likely to occur in eyes with peripheral anterior synechiae in whom the small amount of trabecular meshwork not closed is likely to have compromised outflow function (and is secondarily closed by the iris pigment and tissue generated by the iridotomy). Postoperative inflammation is transient and mild, rarely resulting in posterior synechiae. Closure of the iridotomy may occur during the first few weeks after the procedure, due to accumulation of debris and pigment granules. Rare complications include sterile hypopyon, cystoid macular oedema, retinal haemorrhages and malignant glaucoma145,146. Check the IOP after 1-3 hours [II,D]. Topical corticosteroids for 4-7 days instilled 3-4 times a day. Check the angle regularly with gonioscopy, and the patency of peripheral iridotomy. If the patency is uncertain check with gonioscopy, reconsider the mechanism, perform ultrasound biomicroscopy (UBM) / anterior segment-optical coherence tomography (AS-OCT) if available and/or repeat the iridotomy. Retroillumination alone for judging the patency is insufficient. For prevention of IOP spikes instillation of topical alpha 2 agonist (apraclonidine 1% or brimonidine) 1 hour prior to the procedure and immediately afterwards is optional. Use topical anesthesia. Lenses: Goldmann type gonioscopy lens, Ritch trabeculoplasty lens©, CGA©, Meridian, Latina (SLT), Magnaview. Identify angle landmarks after inspection of all quadrants and place the laser burns between the anterior pigmented trabecular meshwork (TM) and the non-pigmented trabecular meshwork over 180° or 360°. Corneal endothelial damage in corneas with pigment on endothelium (after SLT)157. Check IOP in selected patients (e.g. with advanced glaucomatous damage, one- eyed patients, high pre-laser IOP, exfoliation syndrome, heavily pigmented trabecular meshwork). Use of topical corticosteroids or non-steroidal anti-inflammatory medication 3-4 times daily for 4-7 days. ALT and SLT have the same efficacy153,158. Laser trabeculoplasty is initially effective in 80 to 85% of treated eyes with a mean IOP reduction of 20 to 25% (of 6 to 9 mmHg). The effect wears off over time, for both ALT and SLT159. LT versus medication: In the Glaucoma Laser Trial, after 7 years of follow-up, patients with ALT had lower IOP (1.2 mmHg) than patients on medical treatment, and no difference in progression of glaucoma160. SLT has shown to decrease IOP to a degree similar to that of prostaglandin analogues after 9 to 12 months follow-up161 and appears to be repeatable30,31. Higher baseline IOP is associated with greater IOP reduction after SLT and ALT162,163. The effectiveness of ALT is influenced by the treating surgeon, and success is better when surgeons have more experience in ALT163,164. Pigmentation of the trabecular meshwork (TM) is important. ALT is less successful in eyes with no pigmentation of TM. SLT seems to be independent of the pigmentation of TM. Younger subjects (less than 40 years old) usually respond less to ALT165. Plateau iris syndrome confirmed by a patent iridotomy; the purpose is to enlarge the peripheral angle approach after iridotomy, to decrease the chance of progressive synechial closure. Different types of continuous wave lasers can be used for photocoagulation, most frequently: argon laser, diode laser (810 nm), and the frequency-doubled Nd:YAG laser (532 nm). Instillation of Pilocarpine followed by the same preoperative preparation as for laser trabeculoplasty. Lens: Abraham (+66 diopters), Wise (+103 diopters), CGI©LASAG CH lens or the central non-mirrored part of the Goldmann lens. Laser diode cyclophotocoagulation with the G probe is the cyclodestructive procedure of choice because of the reduced incidence of complications compared with other cyclodestructive procedures [I,D]. Ultrasonic circular cyclocoagulation using high-intensity focused ultrasound delivered by a circular miniaturized device was reported as a safe and effective technique to reduce intraocular pressure in patients with refractory glaucoma171,172. Endoscopic techniques combined with laser technology allow the photocoagulation of ciliary processes not visible via the transpupillary route. The approach can be limbal or through pars plana. Recently, endoscopic cyclophotocoagulation is most commonly performed in conjunction with cataract surgery in cases with early glaucoma175. This procedure is limited to eyes in which a sufficient number of ciliary processes can be visualized gonioscopically, as in cases of aniridia, through a large surgical iridectomy or when broad anterior synechiae cause anterior displacement of the iris. New technology using ultra-sound cyclodestruction is currently under investigation. Rates of complications are higher in neovascular glaucoma and with treatment protocols using more than 80 J per session. Consider analgesia. Topical corticosteroids and atropine instillation for 2-3 weeks. In the immediate postoperative period IOP should be monitored and the anti-glaucoma medication tapered accordingly. The effectiveness of treatment is assessed after 4 weeks. The decision to recommend glaucoma surgery should be made in the light of published clinical trials54,177. 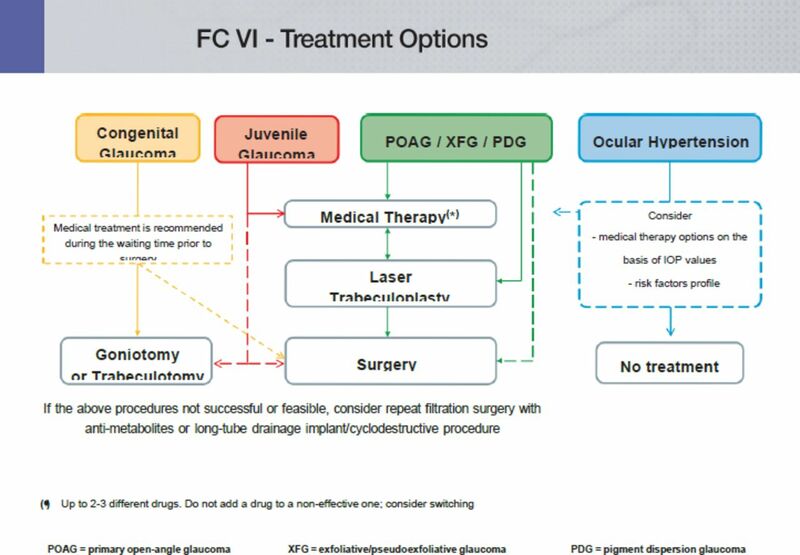 In the individual patient, a multitude of factors must be taken into account when deciding treatment including compliance, stage of glaucoma etc. Nevertheless, surgery should be considered whenever medical or laser treatment would appear unlikely to maintain sight in the glaucomatous eye [I,D]. It should not be left as a last resort (See Ch. 3.1). Angle-closure glaucoma is usually initially approached by laser iridotomy or peripheral iridectomy. Primary congenital glaucoma is usually treated with surgery, likely trabeculotomy or goniotomy, or combinations of filtration surgery with antifibrotic agents. For repeated surgery, cyclodestructive procedures and tube implants are more commonly used (See FC VI). Since glaucoma surgery is successfully practiced in different ways by different ophthalmologists, a detailed description of surgical techniques is not within the scope of this text. The primary goal of surgery is to achieve a Target IOP without additional medication. Additional medications can be used if a Target IOP is not reached by surgery alone. Success rates of a surgical method in terms of IOP lowering can be best evaluated in the absence of adjunctive medical treatment. The number of preoperative versus postoperative medications may also depend on the variable compliance of the individual patient before and after surgery. Also, it is useful to count the percentage of “successes” below a defined IOP level as in Fig. 3.3. It is also important to consider not just the IOP but complications rates and, most importantly, functional outcomes. The most widely used surgical procedure in OAG is the trabeculectomy, which produces a ‘guarded’ fistula between the anterior chamber and the subconjunctival space178,179. The introduction of improved operating microscopes, instruments and suture materials, has led to numerous modifications and refinements of the original operation180. Modifications include the size, shape and thickness of the scleral flap, limbal or fornix based conjunctival flaps, fixed, releasable or adjustable sutures and the use of antimetabolites and other antiscarring agents delivered in different ways to reduce wound healing181,182. In the hands of experts the long-term success rate of filtering surgery alone, or with adjunctive medical therapy in a previously unoperated eye has been reported at up to 90%178; there are large differences however in the criteria used for the definition of success and in the final success rates observed 183-192. The use of stainless steel implants as facilitators for performing filtration surgery should be weighted against the cost of the devices193-196. Long-term IOP control is achieved in many cases, although some patients do require further therapy or repeat surgery178,197,198. The alternatives to trabeculectomy in OAG include non-penetrating surgeries and drainage devices196,199-205. In cases where other forms of therapy, like medicines or laser, have failed. In cases where other forms of therapy are not suitable (e.g. where compliance or side-effects are a problem) or appropriate medical treatment is not available. In cases where a Target Pressure is required to prevent clinically significant disease progression that cannot be reached with topical medications and/or laser. In cases which have such advanced glaucoma and high IOP at presentation that other forms of treatment are unlikely to be successful. Some studies have indicated that in terms of field survival, primary trabeculectomy was superior to medical treatment, but these studies may not be relevant to current medical practice as the evaluation of visual field was not done using todays analyses, and the medical treatment options were very limited206. More recent studies suggest that visual field progression is not significantly different whether initial treatment is medication or trabeculectomy207,208. The ophthalmologist must assess the risks and benefits of early surgery in each individual case. symptoms develop in the operated eye211 [I,D]. Endophthalmitis is more common if the bleb is thin and cystic - a situation more commonly found with the use of a small treatment area of antimetabolites or full thickness filtration procedures. A long-tube drainage device should be used if the bleb cannot be sited beneath the upper lid [I,D]. Trabeculotomy, alone or combined with trabeculectomy, is generally used for congenital and paediatric glaucoma and is less effective in adults212-214 [I,B]. It also may decrease the need for further filtering and shunting procedures215. A novel glaucoma procedure of trabeculotomy by internal approach was recently introduced183,216,217. In this technique, a deep lamella of corneosclera underneath the scleral flap is excised thus removing the outer wall of Schlemm’s canal. The outer layer of the inner wall of Schlemm’s canal is frequently also removed. Percolation of aqueous occurs through the porosity of the remaining trabecular meshwork, possibly through micro-perforations. When the scleral flap is repositioned, a “scleral lake” is created. A collagen implant or a hyaluronic acid device is often used to keep this scleral lake open. In a number of cases, a filtration bleb forms; long-term IOP levels appear higher than with trabeculectomy218-228. In this technique, hyaluronic acid is injected into Schlemm’s canal in addition to the dissection and excision of a deep lamella. The mechanism claimed to increase the outflow is the widening of Schlemm’s canal and of the collector channels as well as diffusion of aqueous from the “scleral lake”186,229,230. The majority of randomised controlled trials suggests that the pressure lowering of non-penetrating glaucoma surgery is not as marked as with trabeculectomy231-234. Canaloplasty is a non-penetrating, bleb-independent, glaucoma surgery that combines a 2-flap dissection to the trabeculo-Descemet’s membrane, like in viscocanalostomy methods, with a circumferential catheterization and viscodilation of Schlemm’s canal. In addition, a 10-0 polypropylene suture is placed within the canal to tension the inner wall and the associated trabecular meshwork with the intention of preventing the Schlemm’s canal collapse thus in theory restoring natural trabeculocanalicular aqueous outflow229,235-238. This technique is indicated in POAG, pigmentary glaucoma and pseudoexfoliative glaucoma and permits combined procedures with cataract surgery [II,D]. Contraindications to canaloplasty are primary or secondary ACG, neovascular glaucoma or cases needing a low target IOP. Intraoperative or postoperative complications (hyphema, hypotony secondary to a break in the trabeculo-descemetic window, hypertension, cataract, endophthalmitis) have a lower incidence than trabeculectomy239-242. Wound healing is one of the main determinants of the long-term intraocular pressure control after filtering surgery243,244. Excessive wound healing or repair leads to scar formation in the conjunctiva. Risk factors for conjunctival scarring are young age, afro- caribbean/hispanic race, inflammatory eye disease (e.g. uveitis, ocular pemphigoid, Stevens-Johnson syndrome), long-term multiple topical medical therapy, aphakia by intracapsular surgery, recent intraocular surgery (<3 months), previous conjunctival incisional surgery, previous failed glaucoma filtration surgery, neovascular glaucoma188,245. Antimetabolites such as 5-fluorouracil (5-FU) and mitomycin-C (MMC) are frequently used in patients undergoing glaucoma filtration surgery in order to reduce postoperative conjunctival scarring and improve drainage [I,A]. The use of these substances continues to be refined. Indications and techniques need to be carefully considered, particularly the use of larger antimetabolite treatment areas to minimise thin cystic blebs246,247 [I,D]. The risk of corneal epithelial erosions, epitheliopathy, late hypotony, bleb leaks, and blebitis/endophthalmitis must be considered [I,D]. The use of antimetabolites, especially MMC, is potentially hazardous, and requires careful surgical technique to prevent over drainage and hypotony, or a thin focal drainage bleb with a higher risk of infection [I,D]. New antifibrotic agents and techniques are under investigation to more specifically target and modulate the biological processes of wound healing after filtration surgery, aiming for a lower risk of complications243,248-250. The use of antimetabolites will enhance the unfavourable effect of any imprecision during surgery. It is important to assess each individual case for risk factors, and/or for the need of low target IOP and titrate the substance and dosage used accordingly based on local experience. If aqueous flow is not well controlled persistent hypotony will occur. Strategies to increase control of flow include smaller sclerostomies, larger and/or thicker scleral flaps, tighter suturing of the scleral flap, and releasable or adjustable sutures [II,D]. Research studies suggest that a large surface area of cytotoxic treatment together with large scleral flaps and accurately sutured fornix-based conjunctival flaps lead to more diffuse, posteriorly extended non-cystic blebs giving a considerable reduction in bleb- related complications such as blebitis and endophthalmitis197,247,251,252 [I,B]. It is advisable for a surgeon not familiar with these drugs to start with weaker agents (e.g. 5-FU rather than MMC) or lower concentrations of MMC [II,D]. Antimetabolites should not enter the eye [I,D]. 5-FU has a pH of 9.0 and one drop (0.05 ml) of MMC is enough to cause irreversible endothelial damage: precautions for use and disposal of cytotoxic substances should be observed [I,D]. 5-FU and MMC are not officially approved for ocular applications. Their use in many cases as adjunctive in filtration surgery, however, has become standard clinical practice. Concentration: 25 or 50 mg/ml undiluted solution. Administration: intraoperatively on a filter paper or a sponge. Time of exposure: usually 5 minutes (shorter time has minimal effect). Rinse: with at least 20 ml of balanced salt solution. Relative contraindication if epithelial problems present. Concentration: 0.1 ml injection of 50 mg/ml undiluted solution. Administration: adjacent to but not into bleb (pH 9), with a small calibre needle (e.g. 30 G needle on insulin syringe). Reflux from the injection site over the ocular surface should be prevented253. Repeated injections are often necessary. Concentration: 0.1-0.5 mg/ml (care must be taken in diluting it to the desired concentration). Administration: intraoperatively on a filter paper or a sponge. Avoid contact with cut edge of conjunctive flap. Time of exposure: 1-5 minutes. Rinse: with at least 20 ml of balanced salt solution. Concentration: 0.1 ml injection of 0.02 mg/ml solution. Administration: adjacent to but not into bleb, with a small calibre needle (e.g. 30 G needle on insulin syringe). Reflux from the injection site over the ocular surface should be prevented253. A very small amount of MMC entering the eye will irreversibly damage the endothelium. It is useful for some needling procedures but recommended only in experienced hands. Irradiation, PDT and inhibition of growth factors have been used, but no long-term clinical studies to support their use are yet available243,249. trials available to support the superiority among any of these procedures nor versus trabeculectomy, for both safety and efficacy254,255. These techniques are currently performed in selected glaucoma patients with early to moderate disease and preferably in combination with cataract surgery [II,D]. (*) THIS LIST IS NOT ALL INCLUSIVE. The EGS does not endorse any product or procedures. Complicated glaucoma cases such as those that have failed previous surgery, secondary glaucomas, congenital glaucomas, et cetera require specialist treatment. In addition to trabeculectomy, other forms of therapy may be necessary such as drainage devices and ciliary body ablation. The use of long-tube drainage devices such as those described by Molteno256-263, Krupin264-266 , Baer veldt 267-272, Ahmed268, 273-280 or Schocket 281-284 are generally reserved for patients with risk factors for a poor result with trabeculectomy with antimetabolite [II,D], although recent trials established their efficacy and safety as a primary surgical procedure258,285 [II,B]. Factors that decrease the chances of successful trabeculectomies and, therefore, make tube surgery attractive, include previous failed filtering surgery with antimetabolites, excessive conjunctival scarring due to previous ocular surgery with severe conjunctival or surface disease, active neovascular disease, paediatric aphakia, or where filtration surgery is going to be technically difficult286,287 [II,D]. When glaucoma surgery is indicated and there is a visually significant cataract the two procedures can be performed combined or sequentially. The decision is to be made according to the clinical findings, after discussing with the patients advantages and disadvantages of each approach [I,D]. Small-incision phacoemulsification cataract extraction is one of the most relevant surgical advances for our glaucoma patients. It allows faster and better visual recovery, and with appropriate techniques it is safely applicable in cases with small pupil, shallow AC or pre-existing filtering blebs. Futhermore it can be combined effectively and safely with filtering procedures, including trabeculectomy, miniature drainage implants and deep sclerectomy205,288-290. Different new glaucoma surgical techniques which can be combined with phacoemulsification (i.e endoscopic cyclophotocoagulation, trabecular bypass stents, ab interno trabeculectomy and canaloplasty) have been proposed in the last years291. Randomized clinical trials are presently needed to clarify this topic. Despite the improved results of small incision phacoemulsification and of filtration surgery with anti-metabolites there is no evidence to support a generalized switch from sequential to combined surgery and viceversa [I,D]. The success rate of combined phacoemulsification and filtration surgery is usually not as favourable as filtration surgery alone and the use of antimetabolites is recommended in all cases.
. Estimating progression of visual field loss in glaucoma. Ophthalmology 1997;104(6):1017-25.
. Rate of visual field loss in progressive glaucoma. Archives of ophthalmology 2000;118(4):481-8.
. Rate and pattern of visual field decline in primary open-angle glaucoma. Ophthalmology 2002;109(12):2232-40.
. Prediction of glaucomatous visual field loss by extrapolation of linear trends. Archives of ophthalmology 2009;127(12):1610-5.
. Prevalence of blindness and low vision in an Italian population: a comparison with other European studies. Eye (Lond) 2006;20(6):661-7.
. Lifetime visual disability in open-angle glaucoma and ocular hypertension. Journal of glaucoma 2007;16(3):313-9.
. Factors associated with lifetime risk of open-angle glaucoma blindness. Acta Ophthalmol 2013.
. Predictive factors for progressive optic nerve damage in various types of chronic open-angle glaucoma. Am J Ophthalmol 2005;139(6):999-1009.
. Factors associated with lifetime risk of open-angle glaucoma blindness. Acta ophthalmologica 2013. The Advanced Glaucoma Intervention Study (AGIS): 7. The relationship between control of intraocular pressure and visual field deterioration.The AGIS Investigators. Am J Ophthalmol 2000;130(4):429-40. The Advanced Glaucoma Intervention Study (AGIS): 12. Baseline risk factors for sustained loss of visual field and visual acuity in patients with advanced glaucoma. Am J Ophthalmol 2002;134(4):499-512.
. Rates of visual field progression in clinical glaucoma care. Acta ophthalmologica 2013;91(5):406-12.
. Natural history of open-angle glaucoma. Ophthalmology 2009;116(12):2271-6.
. Practical recommendations for measuring rates of visual field change in glaucoma. The British journal of ophthalmology 2008;92(4):569-73.
. Canadian Glaucoma Study: 3. Impact of risk factors and intraocular pressure reduction on the rates of visual field change. Archives of ophthalmology 2010;128(10):1249-55.
. Visual field progression differences between normal-tension and exfoliative high-tension glaucoma. Investigative ophthalmology & visual science 2010;51(3):1458-63. Comparison of glaucomatous progression between untreated patients with normal-tension glaucoma and patients with therapeutically reduced intraocular pressures. Collaborative Normal-Tension Glaucoma Study Group. Am J Ophthalmol 1998;126(4):487-97. The effectiveness of intraocular pressure reduction in the treatment of normal-tension glaucoma. Collaborative Normal-Tension Glaucoma Study Group. Am J Ophthalmol 1998;126(4):498-505.
. Predictors of long-term progression in the early manifest glaucoma trial. Ophthalmology 2007;114(11):1965-72.
. Estimating the rate of progressive visual field damage in those with open-angle glaucoma, from cross-sectional data. Invest Ophthalmol Vis Sci 2008;49(1):66-76.
. Practical recommendations for measuring rates of visual field change in glaucoma. Br J Ophthalmol 2008;92(4):569-73.
. A visual field index for calculation of glaucoma rate of progression. Am J Ophthalmol 2008;145(2):343-53.
. A comparison of visual field progression criteria of 3 major glaucoma trials in early manifest glaucoma trial patients. Ophthalmology 2008;115(9):1557-65.
. Racial variations in the prevalence of primary open- angle glaucoma. The Baltimore Eye Survey. JAMA 1991;266(3):369-74.
. Prevalence of open-angle glaucoma in Australia. The Blue Mountains Eye Study. Ophthalmology 1996;103(10):1661-9. How are glaucoma patients identified? J Glaucoma 2003;12(6):451-5.
. A comparison of glaucoma patients identified through mass screening and in routine clinical practice. Acta Ophthalmol Scand 2002;80(6):627-31.
. Reduction of intraocular pressure and glaucoma progression: results from the Early Manifest Glaucoma Trial. Arch Ophthalmol 2002;120(10):1268-79.
. Interim clinical outcomes in the Collaborative Initial Glaucoma Treatment Study comparing initial treatment randomized to medications or surgery. Ophthalmology 2001;108(11):1943-53. The Glaucoma Laser Trial (GLT): 6. Treatment group differences in visual field changes. Glaucoma Laser Trial Research Group. Am J Ophthalmol 1995;120(1):10-22.
. Relationship between ocular perfusion pressure and retrobulbar blood flow in patients with glaucoma with progressive damage. Am J Ophthalmol 2000;130(5):597-605.
. The impact of ocular blood flow in glaucoma. Prog Retin Eye Res 2002;21(4):359-93.
. What is the link between vascular dysregulation and glaucoma? Surv Ophthalmol 2007;52 Suppl 2:S144-54.
. Hypertension, perfusion pressure, and primary open- angle glaucoma. A population-based assessment. Arch Ophthalmol 1995;113(2):216-21.
. Glaucoma risk factors observed in the Baltimore Eye Survey. Curr Opin Ophthalmol 1996;7(2):93-8.
. Incident open-angle glaucoma and blood pressure. Arch Ophthalmol 2002;120(7):954-9.
. Risk factors for incident open-angle glaucoma: the Barbados Eye Studies. Ophthalmology 2008;115(1):85-93.
. The role of ocular perfusion pressure in glaucoma cannot be studied with multivariable regression analysis applied to surrogates. Invest Ophthalmol Vis Sci 2013;54(7):4619-20.
. Optic nerve and neuroprotection strategies. Eye (Lond) 2004;18(11):1075-84.
. Efficacy and safety of memantine, an NMDA-type open-channel blocker, for reduction of retinal injury associated with experimental glaucoma in rat and monkey. Surv Ophthalmol 2001;45 Suppl 3:S284-9; discussion S95-6.
. Efficacy and safety of memantine treatment for reduction of changes associated with experimental glaucoma in monkey, I: Functional measures. Invest Ophthalmol Vis Sci 2004;45(8):2625-39.
. Efficacy and safety of memantine treatment for reduction of changes associated with experimental glaucoma in monkey, II: Structural measures. Invest Ophthalmol Vis Sci 2004;45(8):2640-51.
. Memantine protects neurons from shrinkage in the lateral geniculate nucleus in experimental glaucoma. Arch Ophthalmol 2006;124(2):217-25.
. A randomized trial of brimonidine versus timolol in preserving visual function: results from the Low-Pressure Glaucoma Treatment Study. Am J Ophthalmol 2011;151(4):671-81.
. Neuroprotection for treatment of glaucoma in adults. The Cochrane database of systematic reviews 2013;2:CD006539.
. Target pressure in glaucoma therapy. J Glaucoma 1997;6(2):133-8.
. Blindness and glaucoma: a comparison of patients progressing to blindness from glaucoma with patients maintaining vision. Am J Ophthalmol 2002;133(6):764-72.
. Progress in glaucoma: early detection, new treatments, less blindness. Ophthalmology 2003;110(4):634-5.
. Lifetime visual disability in open-angle glaucoma and ocular hypertension. J Glaucoma 2007;16(3):313-9.
. Canadian perspectives in glaucoma management: setting target intraocular pressure range. Can J Ophthalmol 2003;38(3):189-97.
. Canadian Glaucoma Study: 3. Impact of risk factors and intraocular pressure reduction on the rates of visual field change. Arch Ophthalmol 2010;128(10):1249-55.
. The Ocular Hypertension Treatment Study: a randomized trial determines that topical ocular hypotensive medication delays or prevents the onset of primary open-angle glaucoma. Arch Ophthalmol 2002;120(6):701-13; discussion 829-30.
. Results of the European Glaucoma Prevention Study. Ophthalmology 2005;112(3):366-75.
. Comparative effectiveness of treatments for open-angle glaucoma: a systematic review for the U.S. Preventive Services Task Force. Ann Intern Med 2013;158(4):271-9.
. Factors for glaucoma progression and the effect of treatment: the early manifest glaucoma trial. Arch Ophthalmol 2003;121(1):48-56.
. Canadian Glaucoma Study: 2. risk factors for the progression of open-angle glaucoma. Arch Ophthalmol 2008;126(8):1030-6.
. Intraocular pressure-lowering effects of all commonly used glaucoma drugs: a meta-analysis of randomized clinical trials. Ophthalmology 2005;112(7):1177-85.
. Intraocular pressure reduction with a fixed treatment protocol in the Early Manifest Glaucoma Trial. Acta Ophthalmol 2011;89(8):749-54.
. Noncompliance with ocular hypotensive treatment in patients with glaucoma or ocular hypertension an evidence-based review. Ophthalmology 2005;112(6):953-61.
. Compliance in patients prescribed eyedrops for glaucoma. Ophthalmic Surg 1995;26(3):233-6.
. Drop size and initial dosing frequency problems of topically applied ophthalmic drugs. J Pharm Sci 1974;63(3):333-8.
. The Effect of Varying Dosing Interval on the Efficacy of Intraocular Pressure Lowering Drugs. Invest Ophthalmol Vis Sci 2004;45(5):971-.
. Prevalence of ocular symptoms and signs with preserved and preservative free glaucoma medication. Br J Ophthalmol 2002;86(4):418-23.
. Ocular symptoms and signs with preserved and preservative-free glaucoma medications. Eur J Ophthalmol 2007;17(3):341-9.
. Efficacy and tolerability of prostaglandin-timolol fixed combinations: a meta-analysis of randomized clinical trials. Eur J Ophthalmol 2012;22(1):5-18.
. Efficacy of antiglaucoma fixed combination therapy versus unfixed components in reducing intraocular pressure: a systematic review. Br J Ophthalmol 2008;92(6):729-34.
. Hypotensive effect of latanoprost/timolol versus travoprost/timolol fixed combinations in NTG patients: a randomized, multicenter, crossover clinical trial. Invest Ophthalmol Vis Sci 2013;54(9):6242-7.
. Effects on intraocular pressure and side effects of 0.005% latanoprost applied once daily, evening or morning. A comparison with timolol. Scandinavian Latanoprost Study Group. Ophthalmology 1995;102(12):1743-52.
. A comparison of once-daily morning vs evening dosing of concomitant latanoprost/timolol. Am J Ophthalmol 2002;133(6):753-7.
. Comparison of 24-hour intraocular pressure reduction with two dosing regimens of latanoprost and timolol maleate in patients with primary open-angle glaucoma. Am J Ophthalmol 1999;128(1):15-20.
. Meta-analysis of 24-h intraocular pressure fluctuation studies and the efficacy of glaucoma medicines. J Ocul Pharmacol Ther 2010;26(2):175-80.
. Efficacy and tolerability of prostaglandin analogs: a meta- analysis of randomized controlled clinical trials. J Glaucoma 2008;17(8):667-73.
. Latanoprost nonresponders with open-angle glaucoma in the Japanese population. Jpn J Ophthalmol 2006;50(2):153-7.
. An evaluation of the rate of nonresponders to latanoprost therapy. J Glaucoma 2006;15(3):238-43.
. Effect of bimatoprost on patients with primary open-angle glaucoma or ocular hypertension who are nonresponders to latanoprost. Ophthalmology 2003;110(3):609-14.
. Efficacy of bimatoprost in glaucoma and ocular hypertension unresponsive to latanoprost. Adv Ther 2002;19(6):275-81.
. Preservatives in eyedrops: the good, the bad and the ugly. Prog Retin Eye Res 2010;29(4):312-34.
. German register for glaucoma patients with dry eye. I. Basic outcome with respect to dry eye. Graefes Arch Clin Exp Ophthalmol 2008;246(11):1593-601.
. Prevalence of ocular surface complaints in patients with glaucoma using topical intraocular pressure-lowering medications. Cornea 2010;29(6):618-21.
. Comparison of the short-term effects on the human corneal surface of topical timolol maleate with and without benzalkonium chloride. J Glaucoma 2003;12(6):486-90.
. Quantitative analysis of conjunctival goblet cells after chronic application of topical drops. Adv Ther 2008;25(8):743-51.
. An in vivo confocal microscopy analysis of effects of topical antiglaucoma therapy with preservative on corneal innervation and morphology. Am J Ophthalmol 2009;147(4):725-35 e1.
. [Preservatives from the perspective of glaucoma surgery]. Ophthalmologe 2012;109(11):1073-6.
. Ocular Surface Disease Exacerbated Glaucoma: Optimizing the Ocular Surface Improves Intraocular Pressure Control. J Glaucoma 2012.
. Preservative Exposure and Surgical Outcomes in Glaucoma Patients: The PESO Study. J Glaucoma 2013.
. Effects of glaucoma medications and preservatives on cultured human trabecular meshwork and non-pigmented ciliary epithelial cell lines. Br J Ophthalmol 2011;95(10):1466-9.
. Effects of benzalkonium chloride-preserved, polyquad-preserved, and sofZia-preserved topical glaucoma medications on human ocular epithelial cells. Adv Ther 2010;27(11):837-45.
. Effects of benzalkonium chloride- and polyquad- preserved combination glaucoma medications on cultured human ocular surface cells. Adv Ther 2011;28(6):501-10.
. In vitro comparative toxicology of polyquad- preserved and benzalkonium chloride-preserved travoprost/timolol fixed combination and latanoprost/timolol fixed combination. J Ocul Pharmacol Ther 2011;27(3):273-80.
. Comparison of the effects of ophthalmic solutions on human corneal epithelial cells using fluorescent dyes. J Ocul Pharmacol Ther 2013;29(9):794-802.
. Effects of common ophthalmic preservatives on ocular health. Adv Ther 2001;18(5):205-15. EMEA public statement on antimicrobial preservatives in ophthalmic preparations for human use. In: EMEA, ed. EMEA/622721/2009. London 2009.
. Latanoprost 0.005% test formulation is as effective as Xalatan(R) in patients with ocular hypertension and primary open-angle glaucoma. Eur J Ophthalmol 2012;22(1):19-27.
. A randomized, crossover, open label pilot study to evaluate the efficacy and safety of Xalatan in comparison with generic Latanoprost (Latoprost) in subjects with primary open angle glaucoma or ocular hypertension. Indian J Ophthalmol 2007;55(2):127-31.
. Chemical Analysis of Branded Latanoprost 0.005% Compared With Commercially Available Latanoprost Formulations. ARVO Meeting Abstracts 2010;51(5):3162.
. Pharmaceutical Evaluation Of The Quality And Delivered Dose Of US Latanoprost Generics. ARVO Meeting Abstracts 2012;53(6):5103.
. Comparative Evaluation of Physical Properties of 3 Commercially available Generic Brands of Latanoprost with Xalatan. ARVO Meeting Abstracts 2012;53(6):5096.
. Generic versus brand-name North American topical glaucoma drops. Can J Ophthalmol 2012;47(1):55-61.
. A patient with corneal epithelial disorder that developed after administration of a latanoprost generic, but not a brand-name drug, eye drop. Case Rep Ophthalmol Med 2012;2012:536746.
. Survey of complementary and alternative medicine use in glaucoma patients. J Glaucoma 2012;21(2):79-82.
. Lifestyle, nutrition, and glaucoma. J Glaucoma 2009;18(6):423-8.
. Dietary omega 3 fatty acids decrease intraocular pressure with age by increasing aqueous outflow. Invest Ophthalmol Vis Sci 2007;48(2):756-62.
. The association of consumption of fruits/vegetables with decreased risk of glaucoma among older African-American women in the study of osteoporotic fractures. Am J Ophthalmol 2012;154(4):635-44.
. Nutritional, lifestyle and environmental factors in ocular hypertension and primary open-angle glaucoma: an exploratory case-control study. Acta Ophthalmol 2013;91(6):505-13.
. Nutrient intake and risk of open-angle glaucoma: the Rotterdam Study. Eur J Epidemiol 2012;27(5):385-93.
. Ocular hypotensive effect of late pregnancy with and without high blood pressure. Br J Ophthalmol 1985;69(2):117-9.
. The pregnant woman’s eye. Surv Ophthalmol 1988;32(4):219-38.
. Intraocular pressure trends in pregnancy and in the third trimester hypertensive patients. Acta Obstet Gynecol Scand 1996;75(9):816-9.
. Minimizing systemic absorption of topically administered ophthalmic drugs. Surv Ophthalmol 1993;37(6):435-56. FDA classification of drugs for teratogenic risk. Teratology Society Public Affairs Committee. Teratology 1994;49(6):446-7.
. Side-effect profile of brimonidine tartrate in children. Ophthalmology 2005;112(12):2143.
. Pregnancy and glaucoma. Surv Ophthalmol 2011;56(4):324-35.
. Selective Laser Trabeculoplasty in Fertile Women with Open Angle Glaucoma or Ocular Hypertension. J Korean Ophthalmol Soc 2007;48(11):1494-9.
. Argon laser trabeculoplasty in younger patients with primary open-angle glaucoma. Am J Ophthalmol 1984;97(3):292-5.
. Cyclodiode laser therapy to control intraocular pressure during pregnancy. Br J Ophthalmol 2002;86(11):1318-9.
. Management of anesthesia for the pregnant surgical patient. Anesthesiology 1999;91(4):1159-63.
. Management of glaucoma in pregnancy and lactation. Surv Ophthalmol 2001;45(5):449-54.
. Drugs During Pregnancy and Lactation. The Nederlands: Elsevier Science, 2001. Transfer of drugs and other chemicals into human milk. Pediatrics 2001;108(3):776-89.
. Neuroprotection in glaucoma - Is there a future role? Exp Eye Res 2010;91(5):554-66.
. Clinical evidence for neuroprotection in glaucoma. Am J Ophthalmol 2011;152(5):715-6.
. Neuroprotection for treatment of glaucoma in adults. Cochrane Database Syst Rev 2013;2:CD006539.
. Ocular pharmacokinetics. In: Sears ML, ed. Pharmacology of the eye. Berlin: Springer-Verlarg, 1984.
. The effect of reduced tear drainage on corneal and aqueous concentrations of topically applied f luorescein. Acta Ophthalmol (Copenh) 1990;68(6):633-8.
. Systemic bioavailability and cardiopulmonary effects of 0.5% timolol eyedrops. Graefes Arch Clin Exp Ophthalmol 2002;240(6):430-5.
. Impact of eyelid closure on the intraocular pressure lowering effect of prostaglandins: a randomised controlled trial. Br J Ophthalmol 2012;96(2):250-3.
, Jr. Side effects of timolol. Surv Ophthalmol 1983;28 Suppl: 243-51.
. Improving the therapeutic index of topically applied ocular drugs. Arch Ophthalmol 1984;102(4):551-3.
. Effect of partial compliance on cardiovascular medication effectiveness. Heart 2002;88(2):203-6.
. Adherence and persistence with glaucoma therapy. Surv Ophthalmol 2008;53 Suppl1:S57-68.
. From compliance to alliance. A quarter century of research. Neth J Med 1996;48(4):140-9.
. Evaluation of practice patterns for the care of open- angle glaucoma compared with claims data: the Glaucoma Adherence and Persistency Study. Ophthalmology 2007;114(9):1599-606.
. Compliance barriers in glaucoma: a systematic classification. J Glaucoma 2003;12(5):393-8.
. Compliance with ocular therapy. Surv Ophthalmol 1980;24(4):237-48.
. Facilitating patient compliance in glaucoma therapy. Surv Ophthalmol 1983;28 Suppl:252-8.
. Laser iridotomy and peripheral iridoplasty. In: (eds.) K, ed. In: Ritch R, Shields MB, The Glaucomas St. Louis: Mosby, 1996.
. Laser peripheral iridotomy in primary angle-closure suspects: biometric and gonioscopic outcomes: the Liwan Eye Study. Ophthalmology 2007;114(3):494-500.
. Laser peripheral iridotomy in eyes with narrow drainage angles: ultrasound biomicroscopy outcomes. The Liwan Eye Study. Ophthalmology 2007;114(8):1513-9.
. How large must an iridotomy be? Br J Ophthalmol 1990;74(10):583-8.
. Low-energy linear-incision neodymium: YAG laser iridotomy versus linear- incision argon laser iridotomy. A prospective clinical investigation. Ophthalmology 1987;94(12):1531-7.
. Laser iridotomy in dark irides. Br J Ophthalmol 2007;91(2):222-5.
. The effects of iridotomy size and position on symptoms following laser peripheral iridotomy. J Glaucoma 2005;14(5):364-7.
. Visual symptoms and retinal straylight after laser peripheral iridotomy: the Zhongshan Angle-Closure Prevention Trial. Ophthalmology 2012;119(7):1375-82.
. Immediate changes in intraocular pressure after laser peripheral iridotomy in primary angle-closure suspects. Ophthalmology 2012;119(2):283-8.
. Decompression retinopathy and corneal oedema following Nd:YAG laser peripheral iridotomy. Clin Experiment Ophthalmol 2006;34(2):182-4.
. Simultaneous bilateral malignant glaucoma following laser iridotomy. Graefes Arch Clin Exp Ophthalmol 1993;231(1):12-4.
. Laser trabeculoplasty. In: (eds.) KT, ed. In: Ritch R, Shields MB: The Glaucomas. St. Louis: Mosby 1996.
. Long-term functional outcome after early surgery compared with laser and medicine in open-angle glaucoma. Ophthalmology 1994;101(10):1651-6; discussion 7. The Glaucoma Laser Trial (GLT). 2. Results of argon laser trabeculoplasty versus topical medicines. The Glaucoma Laser Trial Research Group. Ophthalmology 1990;97(11):1403-13. The Advanced Glaucoma Intervention Study (AGIS): 4. Comparison of treatment outcomes within race. Seven-year results. Ophthalmology 1998;105(7):1146-64. The Advanced Glaucoma Intervention Study (AGIS): 9. Comparison of glaucoma outcomes in black and white patients within treatment groups. Am J Ophthalmol 2001;132(3):311-20.
. Laser trabeculoplasty for open angle glaucoma. Cochrane Database Syst Rev 2007(4):CD003919.
. Laser trabeculoplasty for open-angle glaucoma: a report by the american academy of ophthalmology. Ophthalmology 2011;118(11):2296-302.
. Q-switched 532-nm Nd:YAG laser trabeculoplasty (selective laser trabeculoplasty): a multicenter, pilot, clinical study. Ophthalmology 1998;105(11):2082-8; discussion 9-90. The Glaucoma Laser Trial. I. Acute effects of argon laser trabeculoplasty on intraocular pressure. Glaucoma Laser Trial Research Group. Arch Ophthalmol 1989;107(8):1135-42.
. Selective laser trabeculoplasty for the management of open-angle glaucoma in St. Lucia. JAMA Ophthalmol 2013;131(3):321-7.
. Selective laser trabeculoplasty may compromise corneas with pigment on endothelium. Clin Experiment Ophthalmol 2013;41(1):109-10; question and answer 11-2.
. Selective laser trabeculoplasty versus argon laser trabeculoplasty: results from a 1-year randomised clinical trial. Br J Ophthalmol 2006;90(12):1490-4.
. Long term effects on the lowering of intraocular pressure: selective laser or argon laser trabeculoplasty? Can J Ophthalmol 2011;46(5):408-13. The Glaucoma Laser Trial (GLT) and glaucoma laser trial follow-up study: 7. Results. Glaucoma Laser Trial Research Group. Am J Ophthalmol 1995;120(6):718-31.
. Selective laser trabeculoplasty versus medical therapy as initial treatment of glaucoma: a prospective, randomized trial. J Glaucoma 2012;21(7):460-8.
. Laser trabeculoplasty: an investigation into factors that might influence outcomes. Can J Ophthalmol 2011;46(4):305-9.
. Effects of argon laser trabeculoplasty in the Early Manifest Glaucoma Trial. Am J Ophthalmol 2011;152(5):842-8.
. Long-term efficacy of primary laser trabeculoplasty. Br J Ophthalmol 1991;75(1):34-7. The Advanced Glaucoma Intervention Study (AGIS): 11. Risk factors for failure of trabeculectomy and argon laser trabeculoplasty. Am J Ophthalmol 2002;134(4):481-98.
. Argon laser peripheral iridoplasty (ALPI): an update. Surv Ophthalmol 2007;52(3):279-88.
. Laser peripheral iridoplasty for angle-closure. Cochrane Database Syst Rev 2012;2:CD006746.
. “Cyclodiode”. Trans-scleral diode laser cyclophotocoagulation in the treatment of advanced refractory glaucoma. Ophthalmology 1997;104(9):1508-19; discussion 19-20.
. Update on results and complications of cyclophotocoagulation. Curr Opin Ophthalmol 2013;24(2):102-10.
. Endoscopic and transscleral cyclophotocoagulation for the treatment of refractory glaucoma. J Glaucoma 2008;17(3):238-47.
. Miniaturized high-intensity focused ultrasound device in patients with glaucoma: a clinical pilot study. Invest Ophthalmol Vis Sci 2011;52(12):8747-53.
. Histologic effects of a new device for high-intensity focused ultrasound cyclocoagulation. Invest Ophthalmol Vis Sci 2010;51(10):5092-8.
. Ciliary body position variability in glaucoma patients assessed by scleral transillumination. Eye (Lond) 2008;22(12):1499-503.
. Long-term outcome of initial ciliary ablation with contact diode laser transscleral cyclophotocoagulation for severe glaucoma. The Diode Laser Ciliary Ablation Study Group. Ophthalmology 1996;103(8):1294-302.
. Combining phacoemulsification with endoscopic cyclophotocoagulation to manage cataract and glaucoma. Clin Experiment Ophthalmol 2013;41(6):546-51.
. Risk factors for hypotony after transscleral diode cyclophotocoagulation. J Glaucoma 2012;21(3):169-73.
. American Glaucoma Society position statement: glaucoma surgery by surgeons. J Glaucoma 2013;22(6):515.
. A twenty-year follow-up study of trabeculectomy: risk factors and outcomes. Ophthalmology 2012;119(4):694-702.
. Trabeculectomy. Preliminary report of a new method. Am J Ophthalmol 1968;66(4):673-9.
. Enhanced trabeculectomy: the Moorfields Safer Surgery System. Dev Ophthalmol 2012;50:1-28.
. Comparison of limbus-based and fornix-based trabeculectomy: success, bleb-related complications, and bleb morphology. Ophthalmology 2012;119(4):703-11.
. Current variations of glaucoma filtration surgery. Curr Opin Ophthalmol 2012;23(2):89-95.
. Novel glaucoma procedures: a report by the American Academy of Ophthalmology. Ophthalmology 2011;118(7):1466-80.
. Moving the goal posts definitions of success after glaucoma surgery and their effect on reported outcome. Ophthalmology 2010;117(1):18-23 e3.
. Comparative outcomes between newer and older surgeries for glaucoma. Trans Am Ophthalmol Soc 2009;107:127-33.
. Randomized comparison of the intraocular pressure- lowering effect of phacoviscocanalostomy and phacotrabeculectomy. Ophthalmology 2007;114(5):909-14.
. Intraocular pressure outcome in primary 5FU phacotrabeculectomies compared with 5FU trabeculectomies. J Glaucoma 2006;15(6):475-81.
. Trabeculectomy with mitomycin C: outcomes and risk factors for failure in phakic open-angle glaucoma. Ophthalmology 2006;113(6):930-6.
. Safe trabeculectomy technique: long term outcome. Br J Ophthalmol 2006;90(1):44-7.
. 2002 survey of the American Glaucoma Society: practice preferences for glaucoma surgery and antifibrotic use. J Glaucoma 2005;14(2):172-4.
. Needle revision of failing and failed trabeculectomy blebs with adjunctive 5-fluorouracil: survival analysis. Ophthalmology 2004;111(4):665-73.
. Intensified postoperative care versus conventional follow- up: a retrospective long-term analysis of 177 trabeculectomies. Graefes Arch Clin Exp Ophthalmol 2004;242(2):106-13.
. Five-year extension of a clinical trial comparing the EX-PRESS glaucoma filtration device and trabeculectomy in primary open- angle glaucoma. Clin Ophthalmol 2011;5:527-33.
. The Ex-PRESS glaucoma shunt versus trabeculectomy in open-angle glaucoma: a prospective randomized study. Adv Ther 2009;26(3):336-45.
. Comparison of trabeculectomy with Ex-PRESS miniature glaucoma device implanted under scleral flap. J Glaucoma 2007;16(1):14-9.
. Efficacy and safety of a steel drainage device implanted under a scleral flap. Can J Ophthalmol 2009;44(4):457-62.
. Long-term outcomes of intraoperative 5-fluorouracil versus intraoperative mitomycin C in primary trabeculectomy surgery. Ophthalmology 2009;116(2):185-90.
. Nine-year follow-up of trabeculectomy with or without low-dosage mitomycin-c in primary open-angle glaucoma. Br J Ophthalmol 2008;92(12):1666-70.
. The role of the Ex-PRESS glaucoma filtration device in glaucoma surgery. Semin Ophthalmol 2013;28(3):180-4.
. Trabeculectomy with ExPRESS: weighing the benefits and cost. Curr Opin Ophthalmol 2013;24(2):111-8.
, Ahmed, II. Micro-invasive glaucoma surgery: current perspectives and future directions. Curr Opin Ophthalmol 2012;23(2):96-104.
. The changing conceptual basis of trabeculectomy: a review of past and current surgical techniques. Surv Ophthalmol 2012;57(1):1-25.
. Surgical alternative to trabeculectomy. Prog Brain Res 2008;173:255-61.
. Trabecular bypass: effect of schlemm canal and collector channel dilation. J Glaucoma 2006;15(5):446-55.
. Long term effect on IOP of a stainless steel glaucoma drainage implant (Ex-PRESS) in combined surgery with phacoemulsification. Br J Ophthalmol 2005;89(4):425-9.
. Treatment for Glaucoma: Comparative Effectiveness. 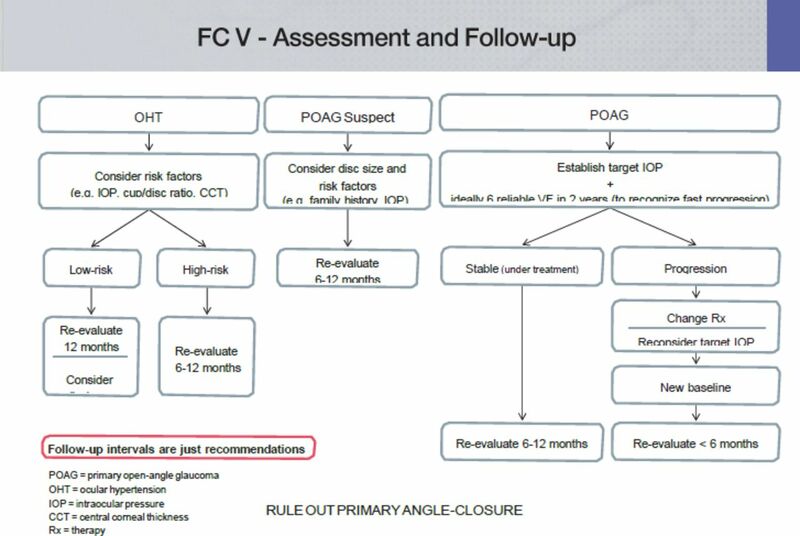 Rockville (MD) 2012.
. Medical versus surgical interventions for open angle glaucoma. Cochrane Database Syst Rev 2012;9:CD004399.
. Visual field progression in the Collaborative Initial Glaucoma Treatment Study the impact of treatment and other baseline factors. Ophthalmology 2009;116(2):200-7.
. Incidence and management of cataract after glaucoma surgery. Curr Opin Ophthalmol 2013;24(1):15-20.
. The silent enemy: a review of cataract in relation to glaucoma and trabeculectomy surgery. Br J Ophthalmol 2011;95(10):1350-4.
. Postoperative infection in penetrating versus non- penetrating glaucoma surgery. Br J Ophthalmol 2010;94(12):1571-6.
. Combined trabeculotomy-trabeculectomy augmented with 5-fluorouracil in paediatric glaucoma. Clin Experiment Ophthalmol 2011;39(3):207-14.
. Success of trabeculotomy in patients with congenital glaucoma operated on within 3 months of birth. Eye (Lond) 2007;21(4):459-64.
. Trabeculotomy versus trabeculotomy-trabeculectomy for congenital glaucoma. Br J Ophthalmol 2006;90(1):125.
. Outcome of angle surgery in children with aphakic glaucoma. J AAPOS 2010;14(3):235-9.
. Evaluation of trabectome in open-angle glaucoma. J Glaucoma 2013;22(3):205-8.
. Ab interno trabeculotomy with the trabectome system: what does the data tell us? Int Ophthalmol Clin 2011;51(3):65-81.
. Deep sclerectomy. Dev Ophthalmol 2012;50:29-36.
. Systematic overview of the efficacy of nonpenetrating glaucoma surgery in the treatment of open angle glaucoma. Med Sci Monit 2011;17(7):RA155-63.
. Combined surgery for cataract and glaucoma: PDS with absorbable SK-gel implant compared with PDS with non-absorbable T-flux implant - medium-term results. Curr Med Res Opin 2010;26(5):1131-7.
. Does phacoemulsification affect the long-term success of non-penetrating deep sclerectomy? Ophthalmic Surg Lasers Imaging 2010;41(2):228-35.
. Nonpenetrating glaucoma surgery: meta-analysis of recent results. J Glaucoma 2008;17(2):139-46.
. [A comparison between absorbable and non-resorbable scleral implants in deep sclerectomy (T-Flux and SK-Gel)]. Ophthalmologe 2007;104(5):409-14.
. Control of intraocular pressure after deep sclerectomy. Eye (Lond) 2006;20(3):336-40.
. Non-penetrating deep sclerectomy versus trabeculectomy in primary open- angle glaucoma surgery. Eye (Lond) 2001;15(Pt 2):197-201.
. Non-penetrating glaucoma surgery: the state of play. Br J Ophthalmol 2001;85(2):234-7.
. Nonpenetrating glaucoma surgery. Ophthalmology 2001;108(2):416-21.
. How does nonpenetrating glaucoma surgery work? Aqueous outflow resistance and glaucoma surgery. J Glaucoma 2001;10(1):55-67.
. Ab externo Schlemm’s canal surgery: viscocanalostomy and canaloplasty. Dev Ophthalmol 2012;50:109-24.
. Primary viscocanalostomy versus trabeculectomy in white patients with open-angle glaucoma: A randomized clinical trial. Ophthalmology 2001;108(2):254-8.
. Viscocanalostomy versus trabeculectomy for primary open angle glaucoma: 4-year prospective randomized clinical trial. Eye (Lond) 2009;23(9):1802-7.
. Primary viscocanalostomy versus trabeculectomy for primary open-angle glaucoma: three-year prospective randomized clinical trial. J Cataract Refract Surg 2004;30(10):2050-7.
. A randomised, prospective study comparing trabeculectomy with viscocanalostomy with adjunctive antimetabolite usage for the management of open angle glaucoma uncontrolled by medical therapy. Br J Ophthalmol 2004;88(8):1012-7.
. Viscocanalostomy versus trabeculectomy in white adults affected by open-angle glaucoma: a 2-year randomized, controlled trial. Ophthalmology 2003;110(5):882-7.
. In vivo analysis of conjunctiva in canaloplasty for glaucoma. Br J Ophthalmol 2012;96(5):634-9.
. Canaloplasty: Three-year results of circumferential viscodilation and tensioning of Schlemm canal using a microcatheter to treat open-angle glaucoma. J Cataract Refract Surg 2011;37(4):682-90.
. Comparing two tensioning suture sizes for 360 degrees viscocanalostomy (canaloplasty): a randomised controlled trial. Eye (Lond) 2010;24(7):1220-6.
. Clinical evaluation of the aqueous outflow system in primary open-angle glaucoma for canaloplasty. Invest Ophthalmol Vis Sci 2010;51(3):1498-504.
. Three-year canaloplasty outcomes for the treatment of open-angle glaucoma: European study results. Graefes Arch Clin Exp Ophthalmol 2011;249(10):1537-45.
. [Canaloplasty : a new alternative in non- penetrating glaucoma surgery]. Ophthalmologe 2011;108(7):637-43.
. Circumferential viscocanalostomy and suture canal distension (canaloplasty) for whites with open-angle glaucoma. J Glaucoma 2011;20(5):298-302.
. Canaloplasty for primary open-angle glaucoma: long-term outcome. Br J Ophthalmol 2010;94(11):1478-82.
. Wound modulation after filtration surgery. Surv Ophthalmol 2012;57(6):530-50.
. Antifibrotic agents in glaucoma filtering surgery. Int Ophthalmol Clin 1993;33(4):165-82.
. Trabeculectomy with mitomycin C in pseudophakic patients with open-angle glaucoma: outcomes and risk factors for failure. Am J Ophthalmol 2006;141(4):652-9.
. Prospective study of surgical outcomes and bleb morphology using indocyanine green as a surgical dye in trabeculectomy with mitomycin C. Clin Experiment Ophthalmol 2012;40(4):e143-8.
. A new, safer method of applying antimetabolites during glaucoma filtering surgery. Ophthalmic Surg Lasers Imaging 2010;41(3):383-5.
. New developments in the pharmacological modulation of wound healing after glaucoma filtration surgery. Curr Opin Pharmacol 2013;13(1):65-71.
. Wound healing and glaucoma surgery: modulating the scarring process with conventional antimetabolites and new molecules. Dev Ophthalmol 2012;50:79-89.
. Ologen implant versus mitomycin C for trabeculectomy: a systematic review and meta-analysis. PLoS One 2014;9(1):e85782.
. Antifibrotic agents in glaucoma surgery. In: Yanof M DJ, ed. Ophthalmology London: Mosby 2008.
. Cystic bleb formation and related complications in limbus- versus fornix-based conjunctival flaps in pediatric and young adult trabeculectomy with mitomycin C. Ophthalmology 2003;110(11):2192-7.
. Decreased corneal complications after no-reflux, low-dose 5 fluorouracil subconjunctival injection following trabeculectomy. Int Ophthalmol 1994;18(4):247-50.
. Update on Minimally Invasive Glaucoma Surgery (MIGS) and New Implants. J Ophthalmol 2013;2013:705915. FDA. FDA/AGS Workshop on Supporting Innovation for Safe and Effective Minimally Invasive Glaucoma Surgery. U.S. Food and Drug Administration - Medical Devices, 2014.
. Otago glaucoma surgery outcome study: comparative results for the 175-mm2 Molteno3 and double-plate molteno implants. JAMA Ophthalmol 2013;131(2):155-9.
. Surgical management of glaucoma with Molteno3 implant. J Glaucoma 2012;21(1):7-11.
. Long-term results of primary trabeculectomies and Molteno implants for primary open-angle glaucoma. Arch Ophthalmol 2011;129(11):1444-50.
. Ahmed glaucoma valve and single-plate Molteno implants in treatment of refractory glaucoma: a comparative study. Am J Ophthalmol 2010;149(6):893-902.
. Graft-free Molteno tube insertion: 10-year outcomes. Br J Ophthalmol 2010;94(5):665-6.
. Molteno aqueous shunt as a primary surgical intervention for uveitic glaucoma: long-term results. Acta Ophthalmol 2010;88(1):33-6.
. The last 11 years of Molteno implantation at the University of Cape Town. Refining our indications and surgical technique. Eye (Lond) 2008;22(1):18-25.
. Long-term results of Molteno implant insertion in cases of chronic angle closure glaucoma. Clin Experiment Ophthalmol 2007;35(6):514-9.
. Comparison of the Ahmed Glaucoma Valve, the Krupin Eye Valve with Disk, and the double-plate Molteno implant. J Glaucoma 2002;11(4):347-53.
. Long-term results of Krupin- Denver valve implants in filtering surgery for neovascular glaucoma. Ophthalmologica 1996;210(4):203-6.
. Krupin disk implantation for complicated glaucomas. Ophthalmology 1994;101(7):1178-82.
. Surgical outcomes of the Baerveldt Glaucoma Implant: differences between surgical techniques in the Rotterdam Eye Hospital. J Glaucoma 2013;22(5):363-8.
. The ahmed versus baerveldt study: three-year treatment outcomes. Ophthalmology 2013;120(11):2232-40.
. Outcomes of fornix-based versus limbus-based conjunctival incisions for glaucoma drainage device implant. J Glaucoma 2012;21(8):523-9.
. Treatment outcomes in the Tube Versus Trabeculectomy (TVT) study after five years of follow-up. Am J Ophthalmol 2012;153(5):789-803 e2.
. Postoperative complications in the Tube Versus Trabeculectomy (TVT) study during five years of follow-up. Am J Ophthalmol 2012;153(5):804-14 e1.
. Baerveldt glaucoma implant insertion in the posterior chamber sulcus. Br J Ophthalmol 2007;91(6):739-42.
. Evidenced-based comparison of aqueous shunts. Curr Opin Ophthalmol 2013;24(2):87-95.
. Clinical outcomes of Ahmed Glaucoma valve in posterior segment versus anterior chamber. J Glaucoma 2013;22(3):183-9.
. Conjunctival Complications Related to Ahmed Glaucoma Valve Insertion. J Glaucoma 2012.
. Long-term success of ahmed glaucoma valve in refractory glaucoma. Int J Ophthalmol 2012;5(1):108-12.
. Trabeculectomy versus Ahmed Glaucoma Valve implantation in neovascular glaucoma. Clin Ophthalmol 2011;5:281-6.
. The Ahmed Glaucoma Valve in patients with and without neovascular glaucoma. J Glaucoma 2010;19(9):581-6.
. Ahmed glaucoma valves in refractory glaucoma: a 7-year audit. Br J Ophthalmol 2010;94(9):1174-9.
. Dynamic tube movement of Ahmed glaucoma valve. J Glaucoma 2009;18(8):628-31.
. [Glaucoma drainage implants]. Klin Monbl Augenheilkd 2010;227(1):49-55.
. Clinical results of modified anterior chamber tube shunt to an encircling band surgery for uncontrolled intraocular pressure. J Glaucoma 2013;22(2):140-4.
. The efficacy of a modified ACTSEB (anterior chamber tube shunt to an encircling band) procedure. J Glaucoma 2007;16(7):622-6.
. Anterior chamber tube shunt to an encircling band (Schocket procedure) in the treatment of refractory glaucoma. Ophthalmic Surg 1992;23(12):804-7.
. The Tube Versus Trabeculectomy Study: interpretation of results and application to clinical practice. Curr Opin Ophthalmol 2012;23(2):118-26.
. New concepts for glaucoma implants-- controlled aqueous humor drainage, encapsulation prevention and local drug delivery. Curr Pharm Biotechnol 2013;14(1):98-111.
. Glaucoma drainage devices: a review of the past, present, and future. Semin Ophthalmol 2010;25(5-6):265-70.
. Ex-PRESS miniature glaucoma device implanted under a scleral flap alone or combined with phacoemulsification cataract surgery. J Glaucoma 2009;18(6):488-91.
. Refractive Outcomes of Combined Cataract and Glaucoma Surgery. J Glaucoma 2013.
. Combined non-penetrating deep sclerectomy with phacoemulsification versus non-penetrating deep sclerectomy alone. Semin Ophthalmol 2014;29(3):146-50.
. New options for combined cataract and glaucoma surgery. Curr Opin Ophthalmol 2014;25(2):141-7. Cataract surgery in glaucoma patients: how much benefit? Am J Ophthalmol 2014;157(1):1-3.
. Effect of phacoemulsification on trabeculectomy function. Clin Experiment Ophthalmol 2013.
. Cataract surgery and glaucoma. Curr Opin Ophthalmol 2010;21(1):20-4.
. The effect of cataract extraction on intraocular pressure. Curr Opin Ophthalmol 2014;25(2):122-6.
. The effect of phacoemulsification on intraocular pressure in medically controlled open-angle glaucoma patients. Am J Ophthalmol 2014;157(1):26-31.
. Combined cataract and trabeculectomy surgery in eyes with pseudoexfoliation glaucoma. J Cataract Refract Surg 2011;37(11):1961-70.
. Management of concomitant cataract and glaucoma. Dev Ophthalmol 2012;50:146-56.
. Phaco-Trabeculectomy in Controlled, Advanced, Open-Angle Glaucoma and Cataract: Parallel, Randomized Clinical Study of Efficacy and Safety. Semin Ophthalmol 2014.